It's time for a heart-to-heart. While I've spent my entire mission talking to followers via Twitter, some things just can't be said in 140 characters or less. So I was thrilled when the editors of Gizmodo asked if I would contribute as a guest blogger, and even more thrilled when they said I could write more than two sentences at a time.One of the most common questions I'm asked, and one of the most difficult to explain, is whether I knew going in that this mission would cost me my life. The answer to that is yes, of course, and there's not a single robotic explorer in our solar system that doesn't know it faces the same fate. Unlike all of you, most of us can't go home again. Perhaps what troubles people most is that my mission will come to an end so soon. They want to know what it is the long-lasting Mars rovers have that I don't? Just like the rovers, I set out on a mission expected to last a mere 90 days. I've outlived my warranty and lasted five months, but those plucky rovers have lasted nearly five years (with no end in sight). What the rovers have that I don't is sunlight and plenty of it. They're on opposite sides of the planet from each other and located close enough to the Martian equator to ensure they get a good dose of sunshine every day (um, sol) of the year. And sun equals life when you're a solar powered robot. I'm located in the far north, above the Martian arctic circle. When I landed at the start of summer, this was the land of the midnight sun. But summer is giving way to autumn and now the sun dips below the horizon for longer periods of time each day. Right now, the sun dips below the horizon for seven hours a day, and it's only a matter of time before I'm in total darkness. And if that wasn't bad enough, the temperatures here will drop to -180F, low enough to destroy circuit boards and crack my solar arrays. "But your name is Phoenix!" some say. "That means you'll come back to life, right?" Many people don't know that the name "Phoenix" was bestowed on me the first time I came back to life. That was in 2003, when NASA decided to pull me out of storage and prepare me for my current mission. I was sitting in storage because my original mission—a flight to Mars in 2001—was cancelled after a 1999 mission was lost during landing. At the time, I was half-built and under the guidance of Ed Sedivy, a spacecraft manager at Lockheed Martin. Ed, as you can imagine, wasn't thrilled to learn his spacecraft had been cancelled, but he understood NASA hesitance in going forward with a mission that had similarities to the '99 mission. Ed moved on to manage other spacecraft for Lockheed Martin, but he didn't forget I was there. In 2002, something wonderful happened. An instrument on the Mars Odyssey spacecraft, an orbiter, detected a lot of "H." That's H as in hydrogen—the H of H2O—sitting there under the Martian surface. "I was blown away by the data," said Bill Boynton, the lead scientist, at a press conference to announce the finding. "This is really amazing. This is the best direct evidence we have of subsurface water ice on Mars." That discovery got a lot of scientists thinking. One of them, Peter Smith, wanted to reach out and touch that ice. And Peter knew about a half-built spacecraft sitting in storage in Denver that just happened to have the right stuff, including a 7.7-foot robotic arm. Peter, of the University of Arizona in Tucson, proposed that I be taken out of storage and sent to touch that ice. He even came up with an appropriate name for a spacecraft that was getting a second chance. He called me Phoenix. Pulling me out of storage didn't immediately bring me to life. No, there was plenty of work to do first. A team at NASA's Jet Propulsion Laboratory was given the ulcer-inducing responsibility to make sure that whatever doomed the ‘99 mission wouldn't happen again. Barry Goldstein, fresh from his work on the Mars Exploration Rover Mission, was appointed to lead the JPL team. Barry and his team at JPL, along with Ed and his team at Lockheed Martin, began to take apart, test, and examine every system. They were on a quest to locate anything that could fail because when it comes to landing, just one mistake can end a mission. They started out with one suspected culprit—the retro rockets used during landing—but in the end they found and fixed over one dozen issues that could have led to some pretty dire consequences I'd rather not think about. So in that sense I arose from the ashes back in 2003 when I began my current trek to Mars. When people ask if I knew going in that I'd eventually become a frozen fixture on the Red Planet, the answer is yes, and it's a heck of a better place to be than locked in storage. 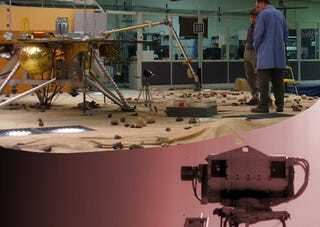 This is part 1 of an ongoing series by our latest guest editor, NASA's Phoenix Mars Lander, as it faces its final days. You can find Phoenix Lander's previous Giz entries here and its Twitter feed here.